Original Wood Glue, 16 oz. 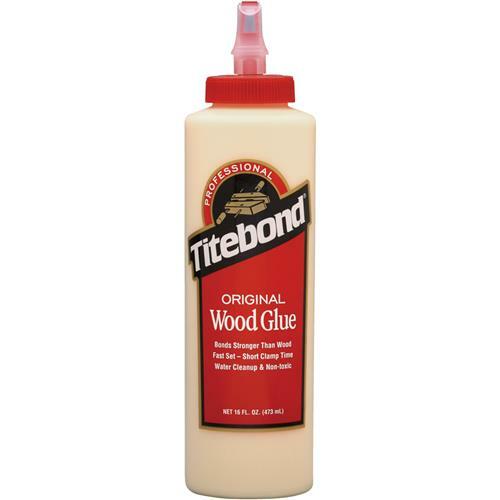 Titebond 5064 - Original Wood Glue, 16 oz. Titebond Original Wood Glue. Recognized as the industry standard for general woodworking applications, this original aliphatic-resin glue has been the preferred choice of professionals for over 50 years. It provides strong initial tack and fast speed of set to reduce clamp time. Titebond Original Wood Glue develops a bond stronger than the wood itself, offers outstanding sandability and is unaffected by finishes. It provides excellent resistance to heat, solvents and mildew. It is ideal for both hardwoods and softwoods, as well as most other porous materials. Titebond Original Wood Glue is easy to use, non-toxic, solvent free and cleans up with water.